Wilhelmina Peragine is overseeing the building of a parklet near 506 Park Drive. On a brutally hot afternoon in late June, volunteers wielding hammers, saws, and cordless drills are slowly transforming two parking spaces outside Kenmore-area restaurant Mei Mei into a tiny public park. In a few days the space will feature benches, greenery, a solar-powered cellphone-charging station, and a spot for locking bicycles, but today there is little more than a patio and some flowerbeds. Progress has slowed, and the group’s energy is ebbing. Wilhelmina Peragine appears at the center of the activity. “If you can hear my voice, clap one time,” she says, projecting loudly. Nearly everyone — volunteers of all ages, including high school students, their grandparents and young siblings — snaps to attention. The moment has been saved, and the volunteers go back to work with palpable renewed enthusiasm. Today’s sweltering heat is just the latest, though, in an exhausting series of challenges that Peragine, a teaching fellow at Harvard Graduate School of Education, has confronted to bring the park from concept to physical reality. For starters, Peragine, whose goal was to test an innovative education idea while doing her bit to enhance urban life, had to pull together a team that included special-education students from Boston public schools, volunteers from Boston Architectural College, city officials, and various nonprofits. While a significant hurdle would involve wading through the city’s notorious tangle of bureaucratic red tape, she got a break in catching the sympathetic ear of a city planner at a time when Boston was already testing the waters on installing its own diminutive public parks — or “parklets” in the language of city designers — as a way to bolster community. Peragine started thinking about the role of art and design in education as a Teach For America corps member in New Orleans, where she helped start an arts program at John Dibert Elementary School between 2007 and 2009. She wondered whether students who failed to thrive in a traditional classroom might be better served by a long-term project that combined creative, artistic tasks with design and carpentry training. That line of thinking culminated in the Parkolation Project. The idea was that Peragine would guide two classrooms of special-education students through the process of designing a parklet and then help them install it in a public space, weaving in lesson plans about sustainability and the environment. She pitched the idea to VSA Massachusetts, where she took a position after completing a master’s degree at the Harvard Graduate School of Education in 2013, and was surprised when it signed on almost immediately. “We’ve never done this before, and neither has anyone else,” Peragine said. A parklet is being built near 506 Park Drive. VSA connected Peragine with Anna Golden, a special-education teacher at Boston Green Academy, a South Boston charter school. Peragine initially visited each of Golden’s two classes for just an hour a week — though that grew to three hours, plus field trips, by February and eventually came to dominate her schedule every day once construction began and the students became invested in the project. Early on, Peragine and Golden asked each student what would constitute an ideal parklet. The answers varied, but common themes emerged: It should provide green space in the city, the students said, and shade for people to rest or hang out. It should be a space for the community to come together. “Parklets are cool because they save the environment and give people a place to chill,” said student Dewayne Rogers. With those ideas in mind, each student built a mockup parklet out of recyclables and craft supplies. Boston Architectural College student Lisa Ishihara paints movable seats that will be part of the Parkolation Project’s parklet. The greenhouse didn’t make it into the final design, but many student ideas did. The bike-lock area was one such suggestion. Others lobbied hard for a solar-powered phone-charging station. The students visited the headquarters of Somerville startup Sistine Solar and eventually commissioned three arrays of green, mosaiclike photovoltaic cells that can light the parklet at night and can charge electronics through a USB connection. At the same time, Peragine was scrambling to raise the $28,000 she would need to finance the construction — and to secure a location where the project could be installed. She set up a Kickstarter website that raised more than $15,000 over the course of a month and got additional funding from the Boston Foundation and the Boston Foundation for Architecture. In September, students also set up a temporary parklet in a parking space near South Station and solicited another $1,000 in donations. 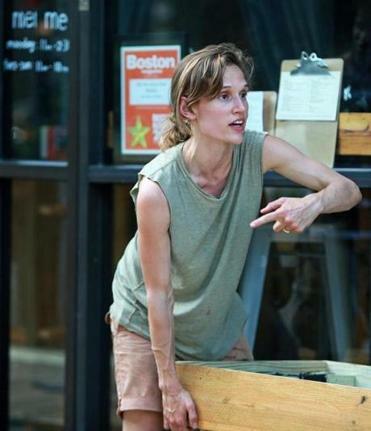 Peragine first reached out to city officials last year, at a time when planner Rachel Szakmary says Boston was already soliciting parklet concepts from community groups. Szakmary would become a key resource, advising the project on permitting and design, and facilitating cooperation with the Water and Sewer Commission and the Department of Public Works. 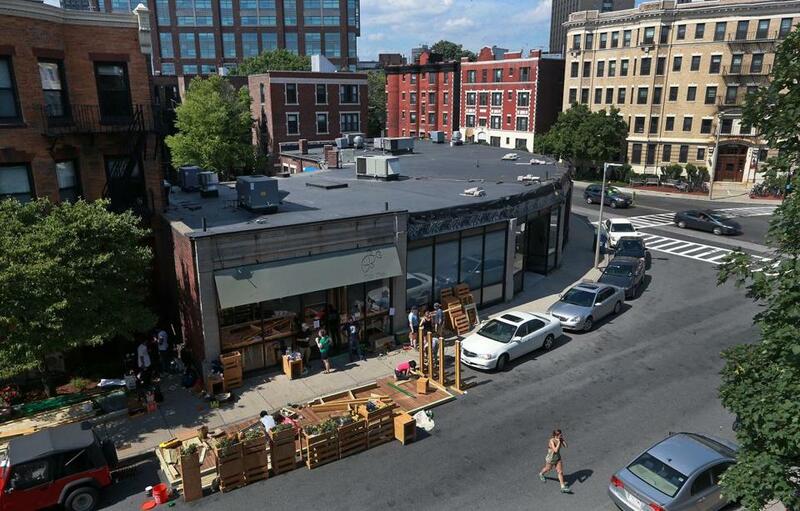 Parklets have become popular in the Bay Area, but they are still new to Boston. In a city with narrow streets and an irregular layout, some are defensive about giving up even a single parking space for a community initiative. City planners try to be as fair as possible, Szakmary said. In the case of the Parkolation Project, they moved a Hubway station on an adjacent street from the parking lane to the sidewalk, so that the number of parking spaces in the neighborhood remained constant. Derek Rieman (left) and 4-year-old Adrias Tanner paints a part of a structure for the parklet being built on a side street near 506 Park Drive. So far the city installed two parklets last summer and put in three parklets this year, in Roslindale, Allston Village, and Brighton. A fourth, in Jamaica Plain, is pending. In another windfall for the project, Boston Architectural College selected the Parkolation Project as a partner for its Gateway Initiative, a program that provides support and mentoring to nonprofit and community design projects. Faculty and architecture students helped the high school students further refine their ideas — first with clay, sketches, and Lego bricks, then with digital tools to create the 3-D model they used to guide the construction. The college also provided a basement space where the students and other volunteers cut lumber and assembled the parklet’s components. On a morning the week before the parklet was set up, Boston Green Academy students used brushes to apply semi-transparent stain to the boards while a song by hip-hop artist Drake played over a speaker. Some of the hands-on carpentry was new not only to members of Golden’s class, but to the college students as well. “We were supposed to be mentors to these kids, but we’re also learning,” said Maria Bolivar, a fourth-year architectural student. The finished parklet’s many wood surfaces evoke an old-fashioned playground, with semi-transparent walls that let natural light through. Customized seats are mounted on rollers so that visitors can arrange the space to fit their needs, and artificial turf spells out “Parkolation” under a bank of flowers. Over the summer, Peragine is planning to hold workshops on composting and other environmental topics at the parklet itself. Peragine plans to write a case study of the project for VSA, with the goal of developing a curriculum built around helping students complete similar projects. 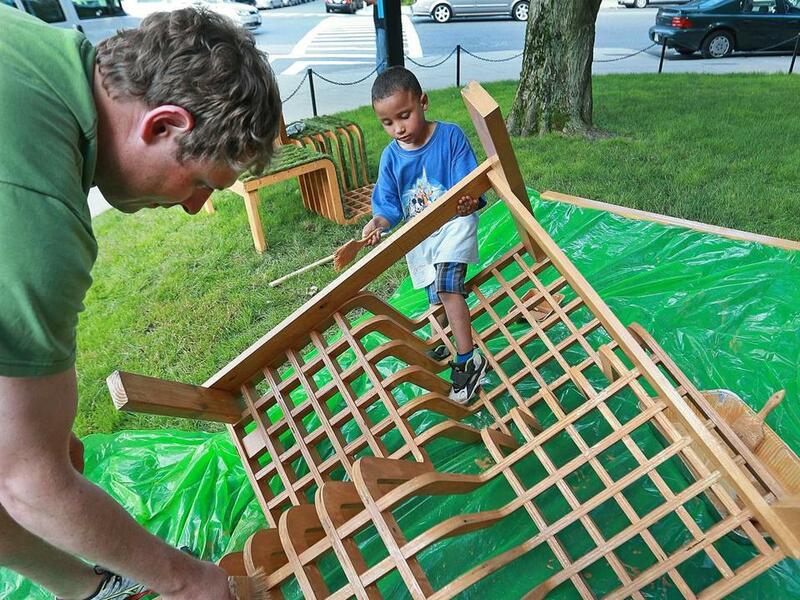 Boston Green Academy students and staff will take down the parklet in November, and it will be stored at the school until next year, when Peragine and Golden hope to incorporate it into next year’s lesson plan. Back at the parklet site, the scorching afternoon drags on, but the group is clearly making progress. Rogers and Bolivar are assembling a frame for a solar panel on the grass next to the sidewalk when three pedestrians stop and quizzically look around at the project and the crew. “What are you guys doing?” a woman asks.